• What Will Young Voters' Turnout Look Like in 2018? Trump's television lawyer, Rudy Giuliani, also delivered blistering attacks on Cohen. "I expected something like this from Cohen," he said. "He's been lying all week. He's been lying for years." The problem is that, back when Giuliani still thought that Cohen was part of Team Trump, he described Cohen as "honorable" and "truthful." So while the spin might help with the base, there is going to be a serious problem if Trump's lawyers ever need to make a legal case that Cohen is a liar who is only saying what the government wants to hear. This is the kind of mistake that one would expect from a former prosecutor who is now trying to be a defense attorney. Given the accusations and denials, either Trump or Cohen is telling a whopper. At the moment, we don't know for certain which one, but Trump's track record of over 3,000 lies since Inauguration Day gives us a hint. Also, the fact that Trump and Giuliani are going after Cohen so hard does suggest that they are very worried. People usually worry a lot more when an opponent is telling the truth rather than when he is making stuff up out of thin air. One might assume, incidentally, that the person Trump is worried about is himself, since he tends to be a tad bit self-centered. However, as CNN's legal analyst Paul Callan points out, the person who is really exposed—assuming Cohen is telling the truth—is Donald Trump Jr. While Senior might very well have lied repeatedly, and while those lies might eventually get him into trouble, he has not lied under oath. Junior, on the other hand, told Congress that his father knew nothing about the Trump Tower meeting. And so, he may well have committed perjury. Trump Organization Chief Financial Officer Allen Weisselberg has been subpoenaed to testify in the investigation of Donald Trump's former fixer Michael Cohen. Weisselberg has worked for Trump for decades and probably knows everything there is to know about Trump's finances—most likely more than Trump himself. On the recording that was released this week, Cohen was heard to say: "I've spoken with Allen Weisselberg about how to set the whole thing [the payment concerning Playmate Karen McDougal] up." Trump responded that Weisselberg is a mere bookkeeper, but that is certainly not true. Trump owns something like 500 separate businesses and can probably not even remember half of them. Weisselberg is the numbers guy who knows them all. If there are skeletons buried somewhere, especially financial ones, he is likely to know about them. One source for the original Wall Street Journal story said that Weisselberg is the #2 person in the Trump Organization, after The Donald himself. He is also the only non-family member of Trump's brain trust. He is clearly a major player and probably will not volunteer any damaging information on his own, but he probably also won't commit perjury to save Trump's skin. If the prosecutors know the right questions to ask, he could be a big source of important information, especially about money laundering. Weisselberg probably also has seen Trump's tax returns and knows his net worth. He certainly knows if Trump has any business deals in Russia or loans from Russian banks or oligarchs. In the second quarter, GDP gew by 4.2%, the highest growth since it hit 5.2% in Q3 of 2014, during the Obama administration. Donald Trump immediately claimed credit for the growth, even though the economy has been humming along for 9 years now. Trump said that the tax cut, trade deals, and repeal of regulations are what did the trick. Presidents typically try to take credit for a strong economy, even though the Federal Reserve Bank probably has more impact on the economy than the president does. Trump also noted that the trade deficit dropped by $50 billion and the reduction was due to the fact that countries could no longer treat the U.S. as a sucker. Rep. Lou Barletta (R-PA) is flailing badly in his race to unseat Sen. Bob Casey (D-PA), with polls consistently giving the incumbent a lead of 15-17 points. Consequently, Donald Trump has decided that he will ride to the rescue, and so will hold one of his trademark rallies in Pennsylvania on Thursday of next week. If Trump really did achieve a swing of 45 points with a single tweet, that would give him by far the biggest and most powerful coattails in the history of American politics. But, of course, it is not true—Kemp consistently had a huge lead in polls. And in the case of Pennsylvania, there is little chance that a Trump rally (even if it's accompanied by a tweet) will move the needle. Beyond the obvious problem that two hours of bragging to the true believers about his own record, particularly three months before the election, is not likely to help Barletta much, there's also the fact that Trump's approval is pretty far underwater in the Keystone State. Rep Jason Lewis (R-MN), prior to his Congressional career, was a right-wing radio talk show host. That's a job that sometimes entails saying outrageous things, and some of those things are now coming back to haunt the Representative. He's already earned a bunch of the wrong kind of headlines for misogynistic remarks he made during that time, particularly as regards women who would presume to use birth control. Now a number of additional impolitic comments have come to light. Given his politics, and his medium, Lewis' words are somewhat predictable. He said, on several occasions, that Christians should be much freer to discriminate against LBGT people. He also referred to people on welfare as "parasites" and "scoundrels," and said the black community had "traded one plantation for another." Because if there is one kind of person who should be drawing parallels to slavery, it is a well-off white man. In 2016, the Democrats did much worse among noncollege whites and much better among college-educated whites than they did in 2012. The effect is striking. A similar effect holds for income. In 2012, white neighborhoods at all income levels voted Republican. In 2016, all neighborhoods with a median annual income below $150,000 voted Republican and all above it voted Democratic. Together these data suggest a clear shift in voting patterns, with poor, non-college whites firmly Republicans and rich college whites firmly Democrats. First, the good news for the GOP: Rural voters approve of Trump, 56% to 42%. That means he is holding his base, even after the disastrous press conference in which he supported Russian President Vladimir Putin over his own intelligence services. Now the bad news: He is under water with all the other key groups, including the "Never Hillary" independents, white suburban women, millennials, and black women. What Will Young Voters' Turnout Look Like in 2018? 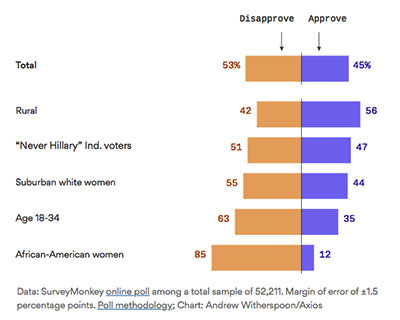 SurveyMonkey/Cosmopolitan March 13 48% of young voters are "absolutely certain" they'll vote. Harvard Institute of Politics April 10 37% of young voters are "definitely voting". AP-NORC and MTV May 30 32% of young voters are "certain to vote". PRRI/The Atlantic July 1 28% of young voters are "absolutely certain" they'll vote. There's a pretty clear trendline there, suggesting that enthusiasm is fading as we move from spring into summer. However, one should probably not put too much stock in that. This is a particularly difficult question to poll, and the results are particularly likely to be affected by wording choices (e.g, "certain to vote" vs. "absolutely certain to vote"), and by whatever happens to be in the headlines that day.